Here are just a couple of internal tools and side projects I’ve tackled for fun. I’m a big fan of working on internal tooling as it’s a great opportunity to rapidly build and test ideas and concepts that can be helpful in production. This is just a simple web app that I helped build with our IT and HR teams that maps out the org chart for Zendesk and provides an easy way to see how to get in touch with people and where they are located (both physically and in the org). Symphony is a collaborative text editor I designed with several engineers from the Zendesk Support team in order to test out the viability of implementing Draft.js as a shared services component for text editors inside of Zendesk products. The Zendesk Apps Console is a small project I’m working on with our team in Manila to rebuild the experience for third-party developers working with the Zendesk platform by providing a simple dashboard for managing their developer account settings, payments, metrics, and app distributions. The Talk Call Console is an app embedded inside of the Support product that allows agents to view and access ticket and user data in the full Support interface while taking and managing multiple phone calls from end-users. With Support getting a number of updates, I spent some time on the side seeing how the Call Console could be updated to conform to the Electroid Design Language and feel consistent with other Zendesk apps and products. 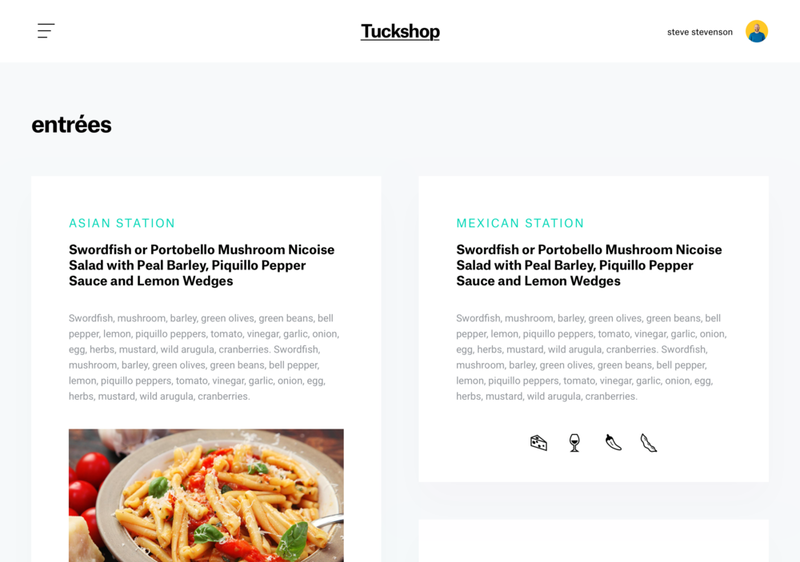 This was a Hack Week project to explore updating the internal Dropbox cafe menu to refresh the visual direction and allow for features such as nutrition and recipe tracking.